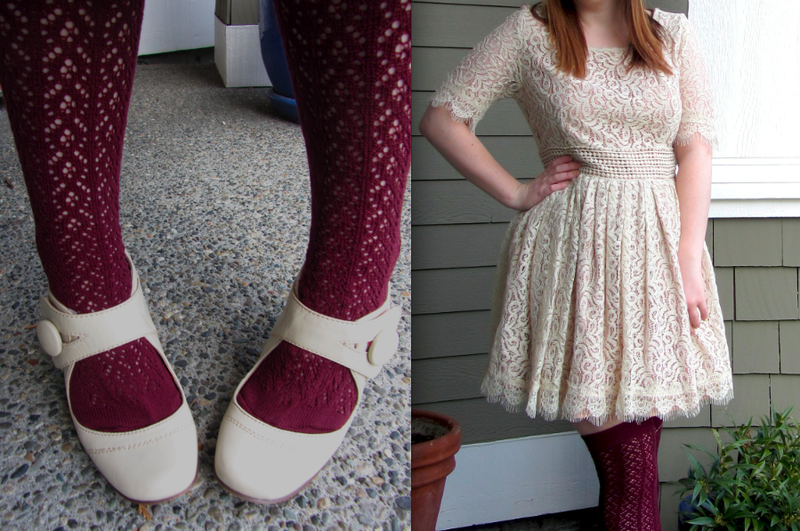 Posted on April 2, 2012 by Cortney A.
Outfit Details: Dress: Modcloth; Jacket (old): Gap; Socks: Tabbisock, via Modsock; Shoes: Miu Miu, via Ebay. 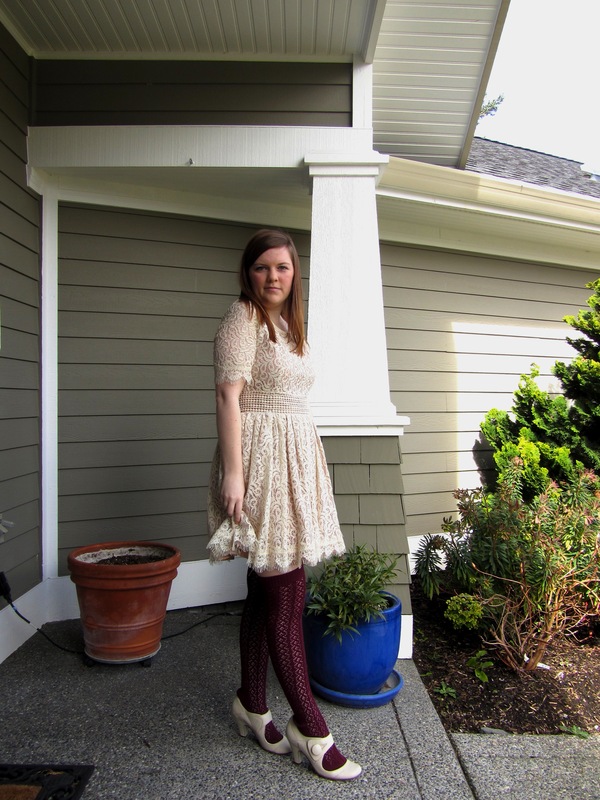 I purchased this dress off Modcloth over a year ago on sale. I was so excited to get it, only to find it ran super small. I couldn’t fit into it. There was just no way it was going to work for me. I couldn’t give up on it though, so it hung in my closet for about a year until a couple weeks ago when I decided to try it on. Lo and Behold: It fit. It’s a little sweet, so I added the old leather jacket I got in 7th grade and the Miu Miu’s I snagged off Ebay a little while back. The knee high socks were because it was a little chilly. I love these shoes. That is all. 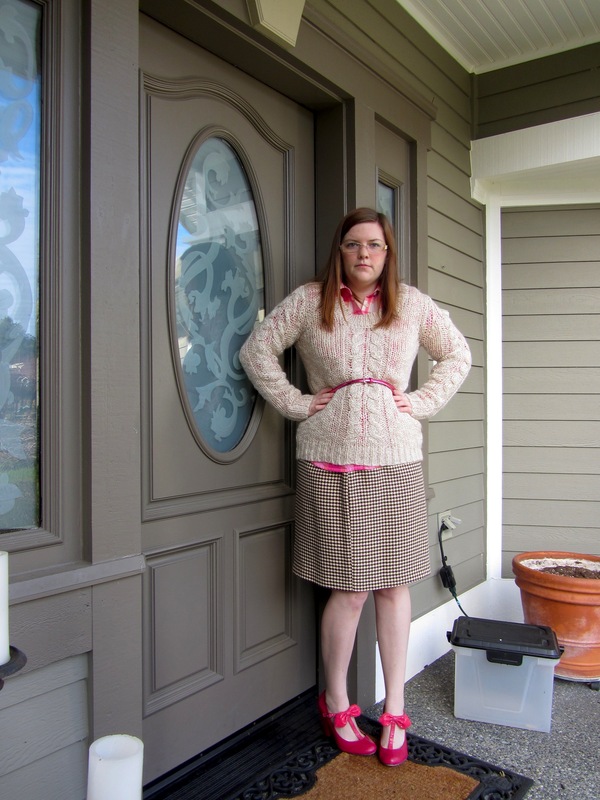 Posted on March 27, 2012 by Cortney A.
Outfit Details: Knit: Charter Club; Sweater: Target; Skirt: Laundry by Shelli Segal, thrifted; Shoes: Shellys London, via Modcloth.com. 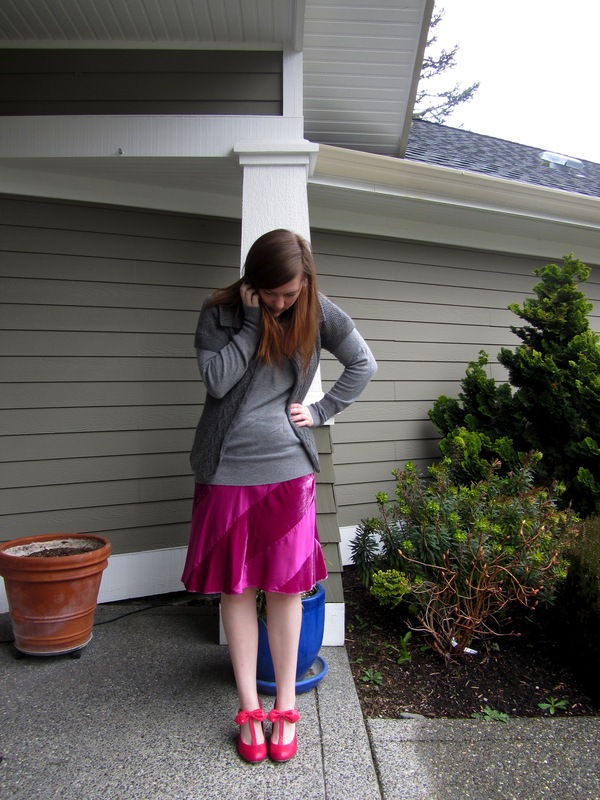 Originally, it was just the sweater and the skirt but it didn’t look finished to me. So I threw this knit thing over, and I felt like it looked a little better. I was also lazy, and didn’t feel much like jewelry. 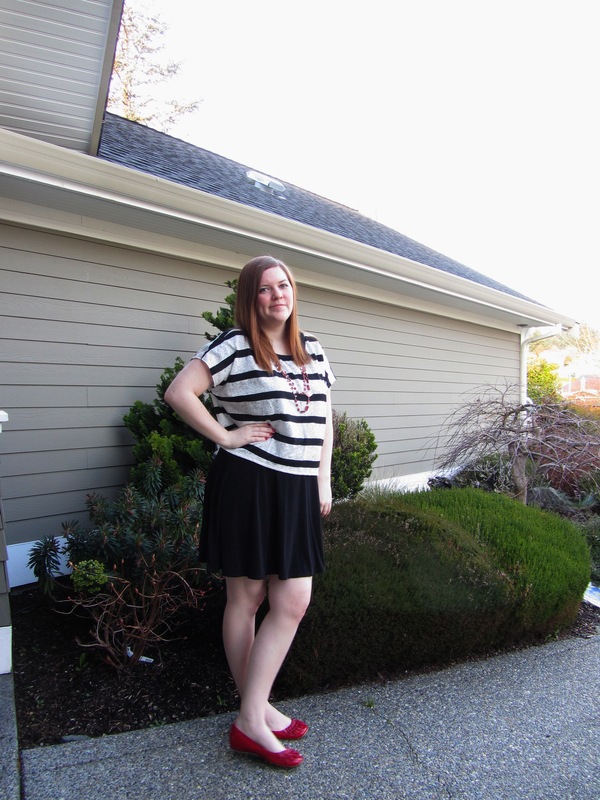 Also, I’m really loving the sunshine that Washington State is getting lately! It’s been wonderful outside. These are one of my all time favorite pairs of shoes. The pink bows always lift my mood. 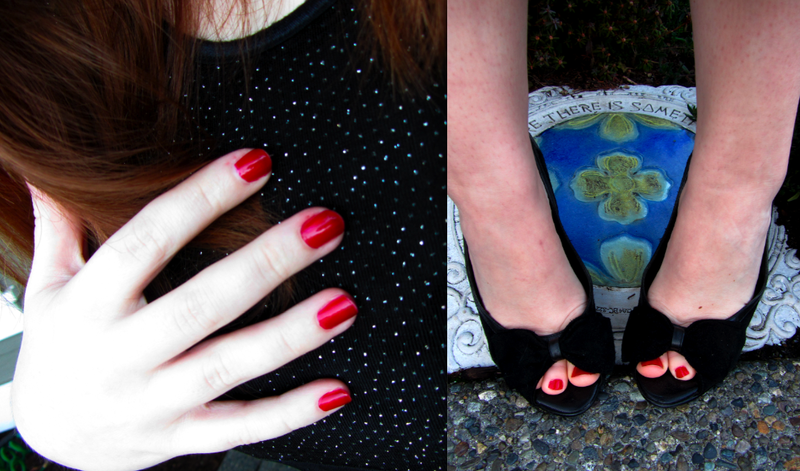 Also it was completely unintentional, but i love that I matched my nail polish to my outfits. Essie’s Chincilly is my new favorite nail color. Posted on March 21, 2012 by Cortney A.
Outfit Details: Dress: Darling UK, via Saisons Boutique; Socks: Tabbi Socks, via ModSock Boutique; Shoes: Stolen from Mom. While I was in Bellingham, I finally went to the store a friend of mine raved about. It was store full of socks. Just socks. They had knee highs, over the knees, ankle socks… You could get socks with unicorns, gnomes, fish, cats, words (I was partial to the “bookworm” socks), or just stripes. 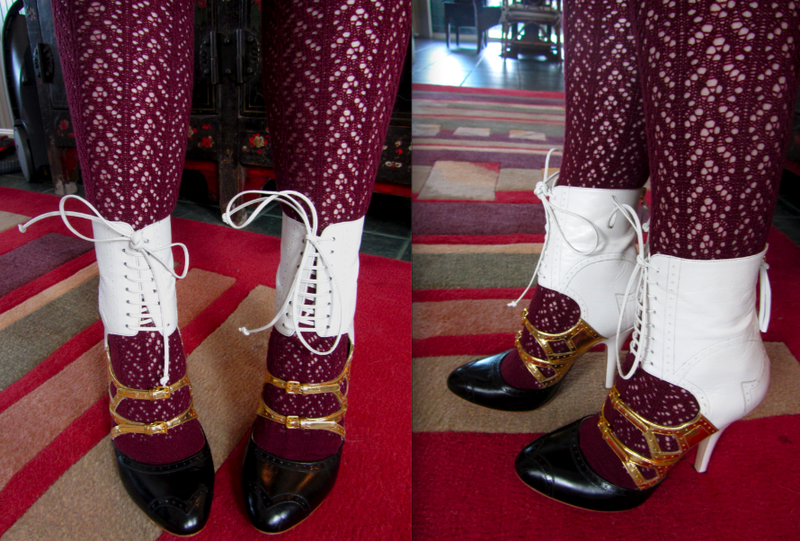 I ended up finding these maroon/wine over-the-knee socks there. I’ve always had the hardest time finding over-the-knee socks in stores, so to find a gigantic selection was kind of overwhelming. I only ended up buying this pair for now, though I plan to make a trip back to the store. 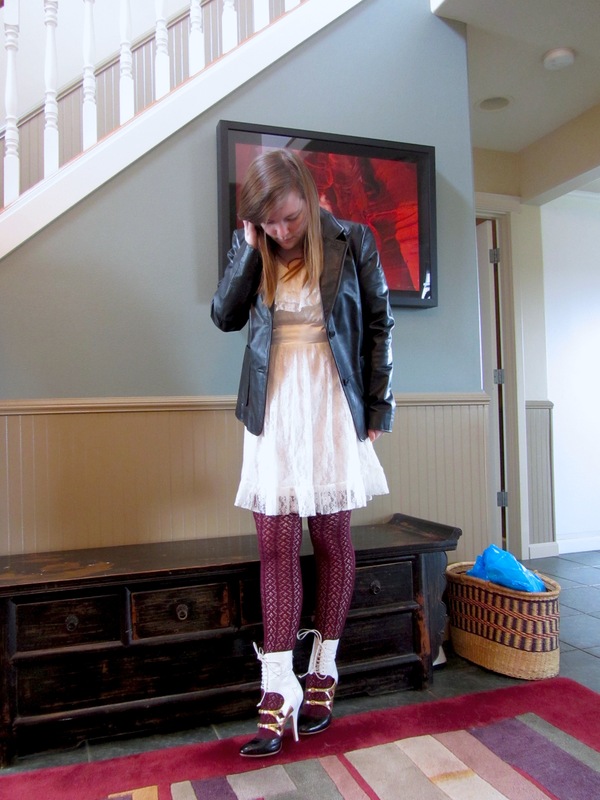 This lace dress is a major wardrobe staple of mine. I’m pretty sure it goes with everything I own. I’ve actually written down over 20 outfits involving this dress. Now, I’ve just got to start putting them into play. 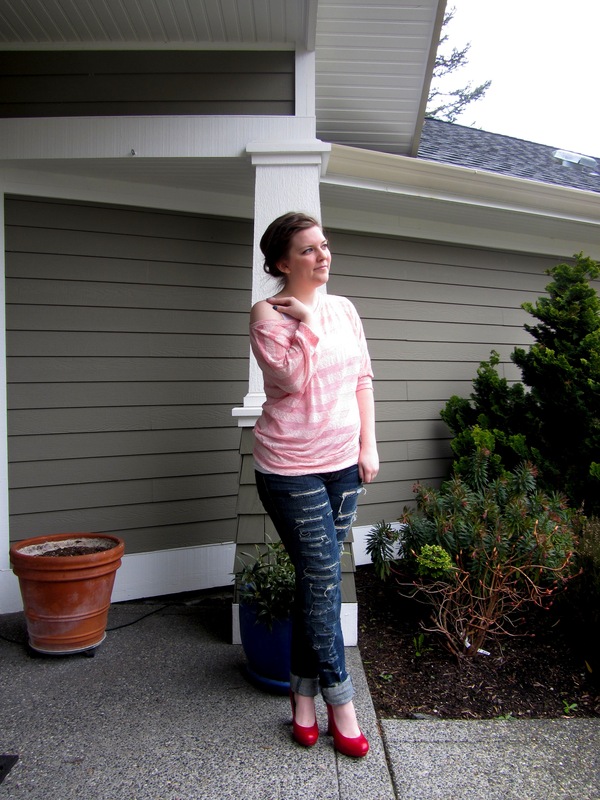 Posted on March 9, 2012 by Cortney A.
Outfit Details: Shirt: Cotton Candy, via local boutique; Jeans: Per Se; Shoes: thrifted. 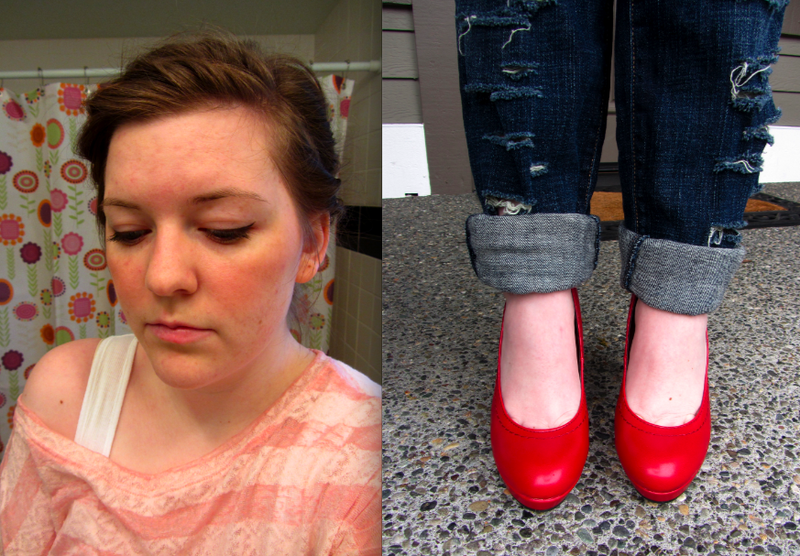 I thrifted these shoes awhile ago, when I had a very fun and long shopping day with two friends. These were one of the two pairs of shoes I picked up. 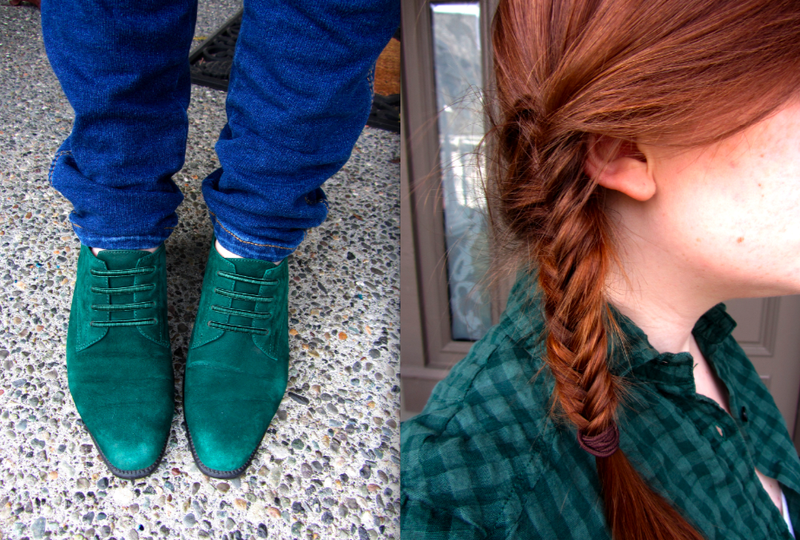 I couldn’t pass up the pretty green, and as a bonus–they looked like leprechaun shoes. I still have no clue why I consider that a bonus, but it totally is. In other news, after figuring I could manage blogging again with my new job, I managed to get ill. Tuesday was feverish fun, Wednesday was swollen neck glands, coughing, painful swallowing, and really painful headache, and Thursday was just painful swallowing. I should (hopefully) be back to tip top shape again by today. 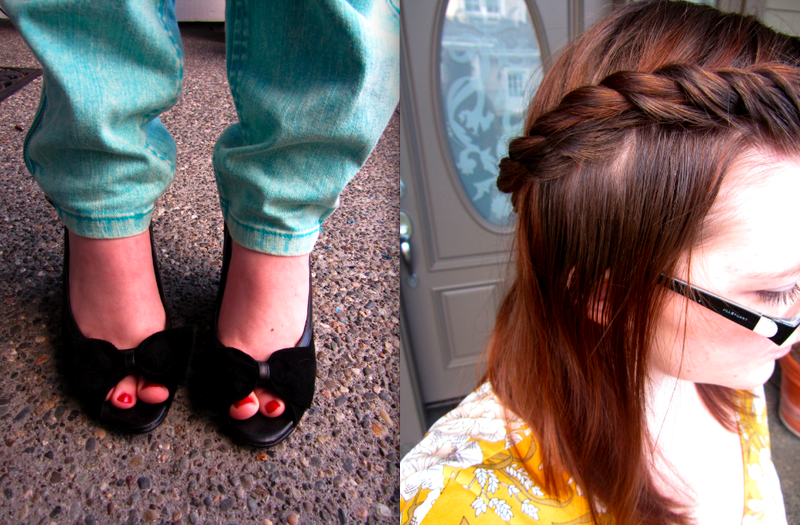 My (newest) goal for this blog is to attempt some easy hairstyles from time to time to enhance my outfits. Hair can really make or break a look, I think, and I’d really like to get back into having fun with my hair, especially since its getting longer now. 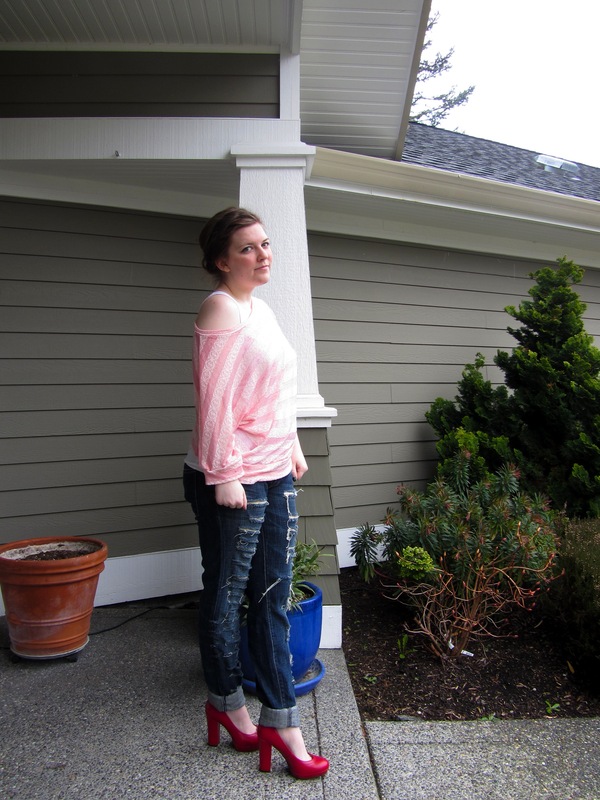 Posted on March 6, 2012 by Cortney A.
Outfit Details: Top: Forever 21; Pants: Forever 21; Shoes: White House, Black Market. 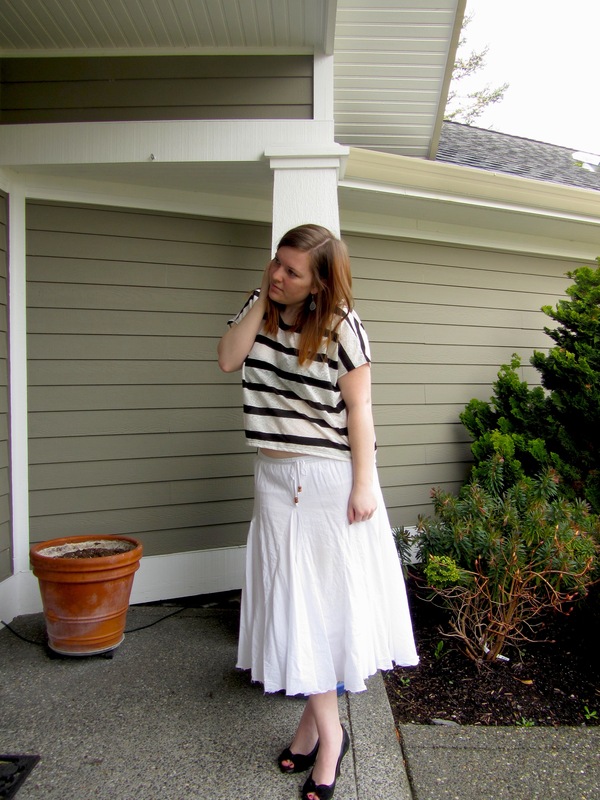 This is my first outfit post in awhile (almost an entire week). I’ve been terribly busy and mostly wearing either yoga pants, a tank top, and a ponytail or my work uniform of black slacks and standard issue t-shirt. Obviously, these are not very photographable. 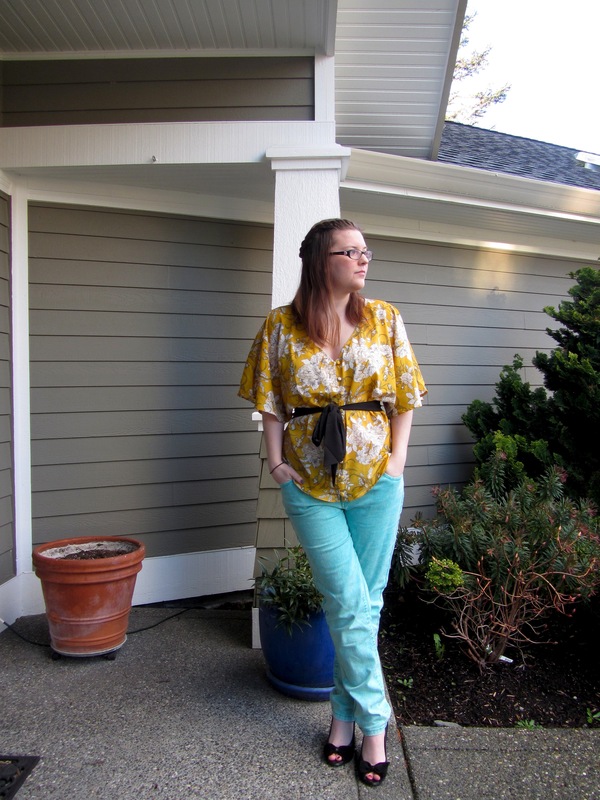 However, these minty jeans are my new closet favorite at this point. I think I’ve worn them at least 3-4 times in the past week. I throw them on to run errands and they’ve really become my go-to piece. I decided on black shoes to match the black sash. I would have loved to do yellow, but I don’t have a pair of yellow shoes, sadly. This twist was my attempt at pretty hair. It’s not nearly as successful as my last attempt. I think I used a bit too much hair in the twist and didn’t leave enough down. 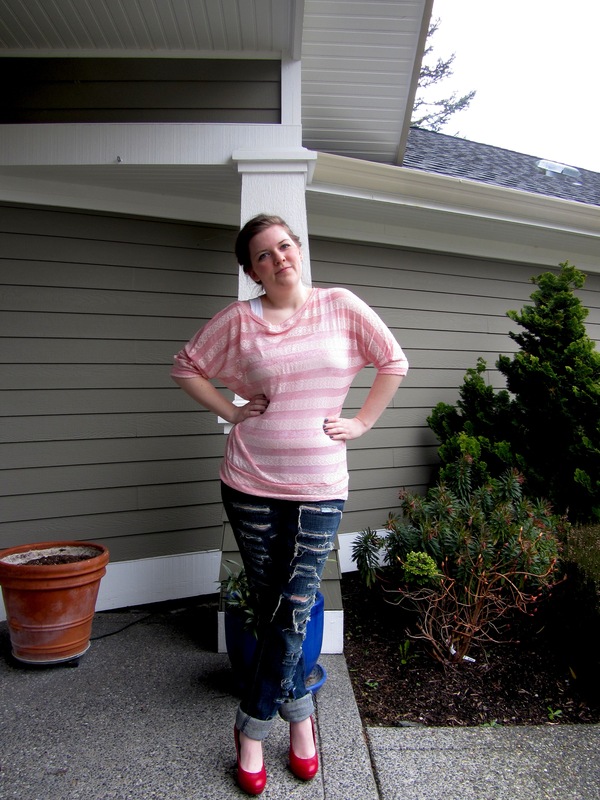 Posted on February 29, 2012 by Cortney A.
Outfit Details: Sheer Top: Romy; Tank: American Eagle; Jeans: Current Elliott, via BeyondtheRack; Shoes: TJ Maxx. I built my outfit around the hair. 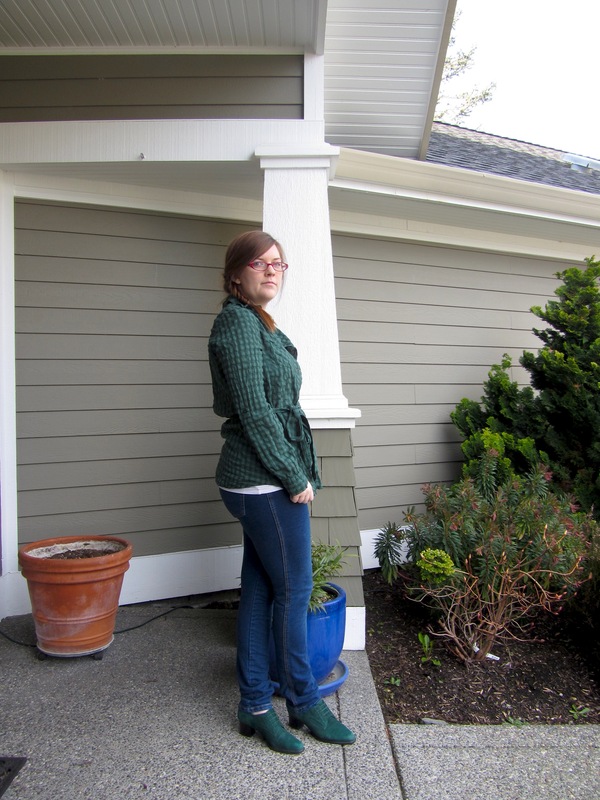 I’ve wanted to pair these jeans with heels for awhile but the timing never seemed right. 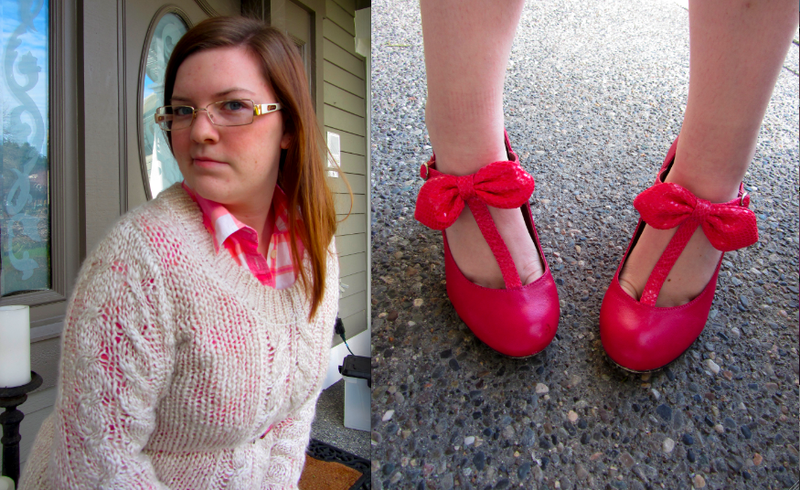 I picked the pink top because I felt like pairing red and pink together again. I also thought it added to the romantic-ness of the hair. I had to change later though because it started SNOWING (I know. It’s almost March. And we got snow.) and because I had to work. Sadly, the hair/makeup shot is a bathroom shot. I could not for the life of me get a decent shot while outdoors. I just went with a simple cat eye and mascara. The best part about the hair thought? It stayed in all day. I had it in for ten hours, and I did not use hairspray except on the back! Even if it got messier–it looked like it was supposed to be that way! I’ll definitely be doing this one again, plus it’s much easier than a french braid. 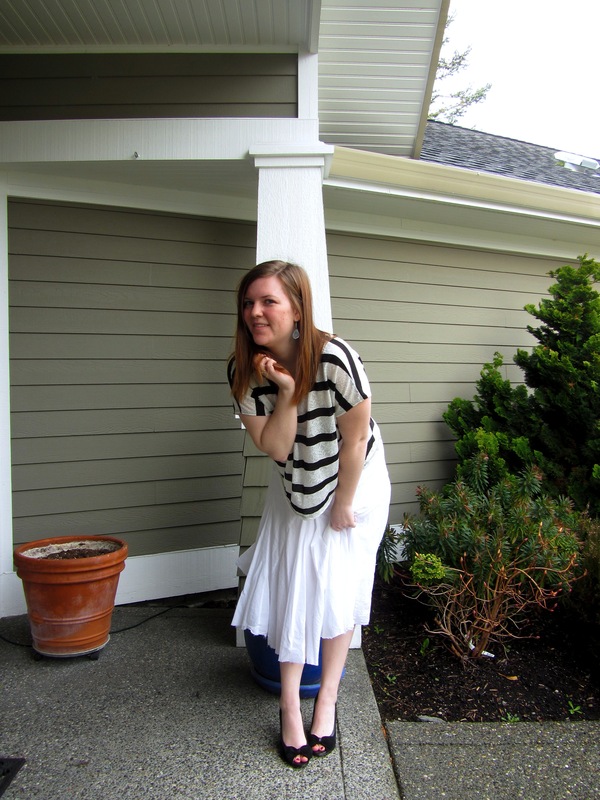 Posted on February 22, 2012 by Cortney A.
Outfit Details: Top: via Ross; Skirt (old): Billabong; Shoes: White House, Black Market; Earrings: from Hawaii. 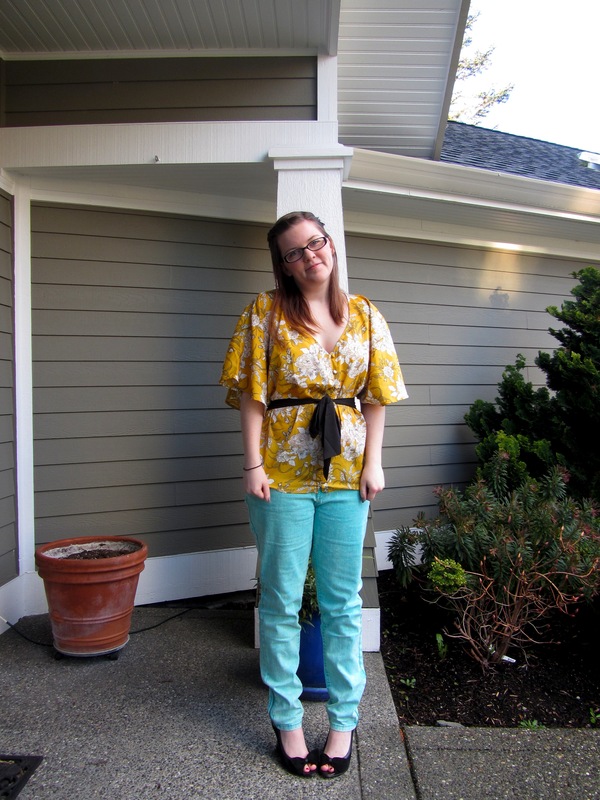 Some days I throw an outfit together based around one garment I want to wear. I knew I wanted to wear this top because it is ridiculous large and comfortable. It is a big square chunk of fabric. Probably not super flattering, but I love it. I also knew I did not want to wear pants. 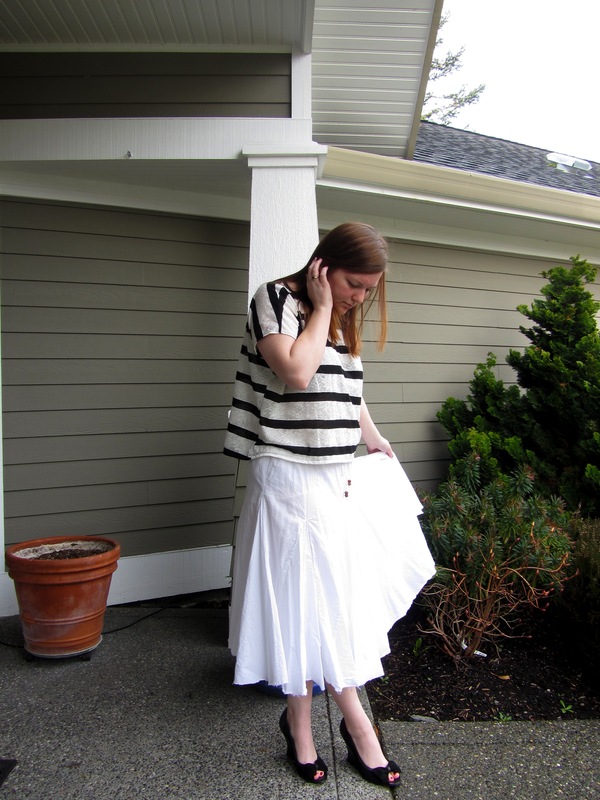 Hence, I snagged this skirt from the back of my closet. I’ve owned it since I was in 7th or 8th grade, and it’s kind of a miracle it still fits (barely). It’s fun and perfect for summer, really, and I really really wish it was summer right now. Dress for the weather you want, right? On other days, most of the pictures of today’s outfit would have been considered outtakes and I probably would not have posted them. However, today I felt like they captured the mood of the outfit perfectly. 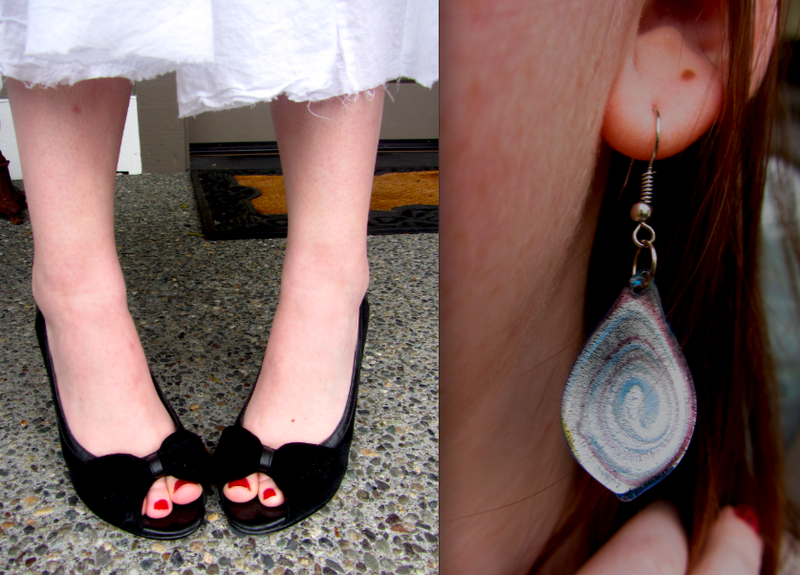 These earrings were incredibly difficult to photograph. They seem to reflect light exceptionally well. I got them in Hawaii years ago, at a little local store on one of the islands. I snagged on other pair of earrings there too. In other news: As I mentioned The Game On! Diet before, I actually lost a pound and a half the first week! I’m pretty excited to see my progress continue as I go into this week, even though I’ve started to have some super chocolate cravings! 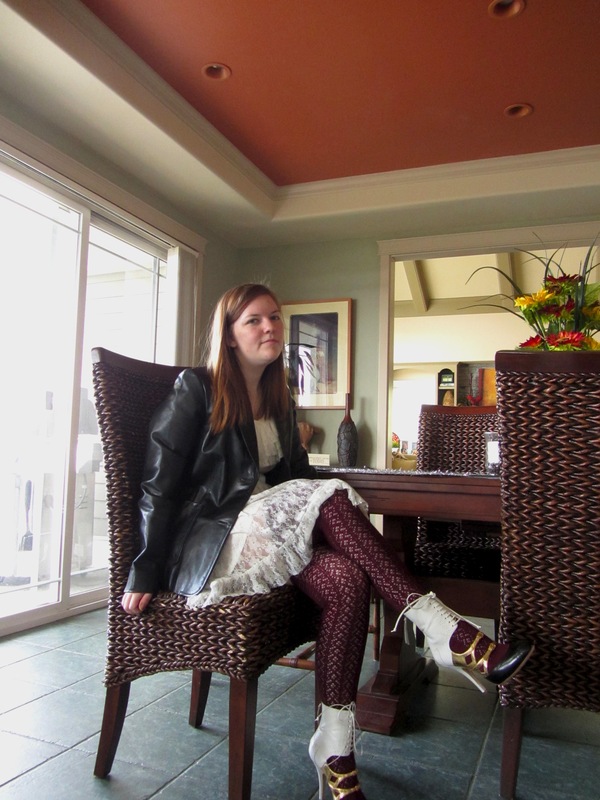 Posted on February 16, 2012 by Cortney A.
Outfit Details: Dress: thrifted from Value Village; Shoes: White House, Black Market. Today’s challenge for the ABC’s of Style is to show how you wear one piece of clothing in two different ways. I chose this dress that I thrifted from Value Village recently. It’s dressy enough that I can wear it out on a dinner date in the evening (as seen above). The top part is pretty glitzy, so it doesn’t require a lot of accessories. I normally would put in earrings but one of my ears started bleeding the other day, so I decided not to aggravate it. 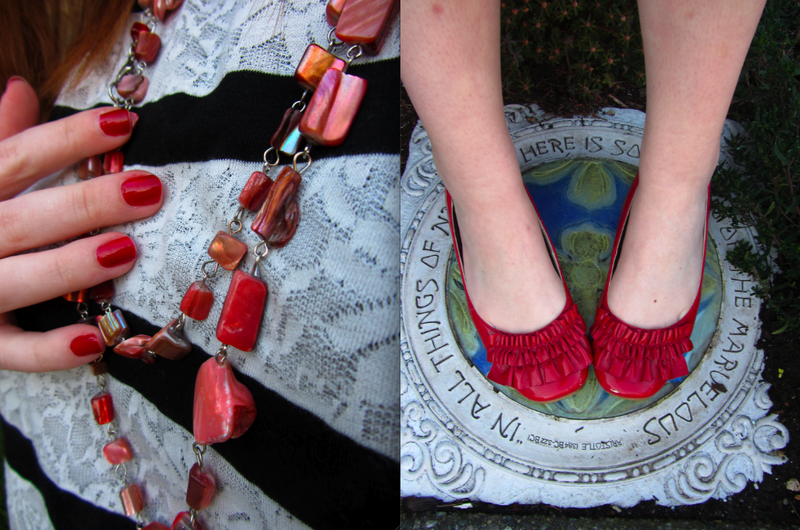 Outfit Details: Dress: thrifted, via Value Village; Top: via Ross; Shoes: via Ross; Necklace: Kohl’s. Luckily this pretty little dress can be dressed down! 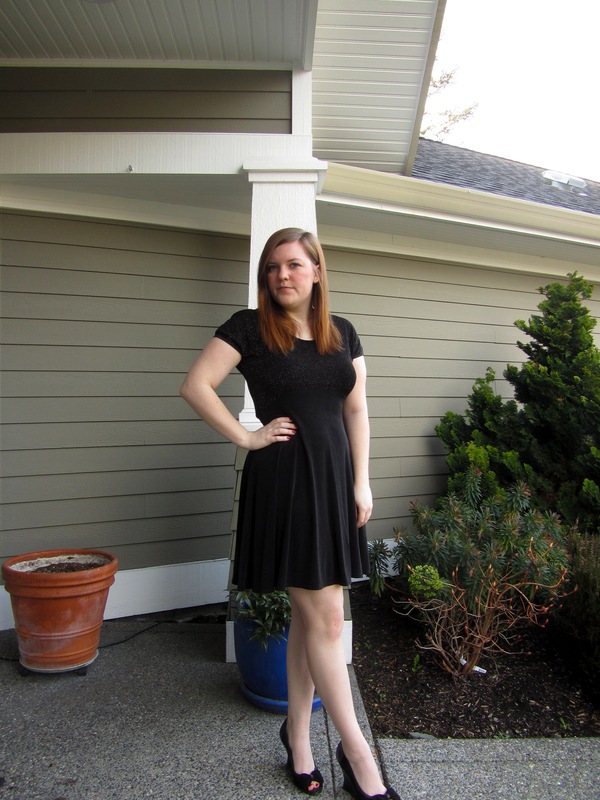 The second way I chose to wear this dress was as a skirt! 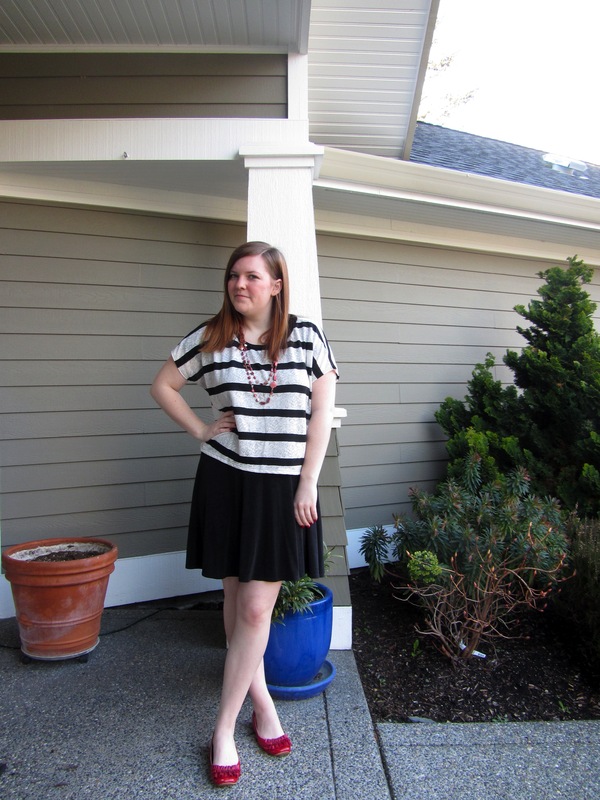 I just layered this square-ish striped top over it, and I felt like it gave a nice nautical vibe. 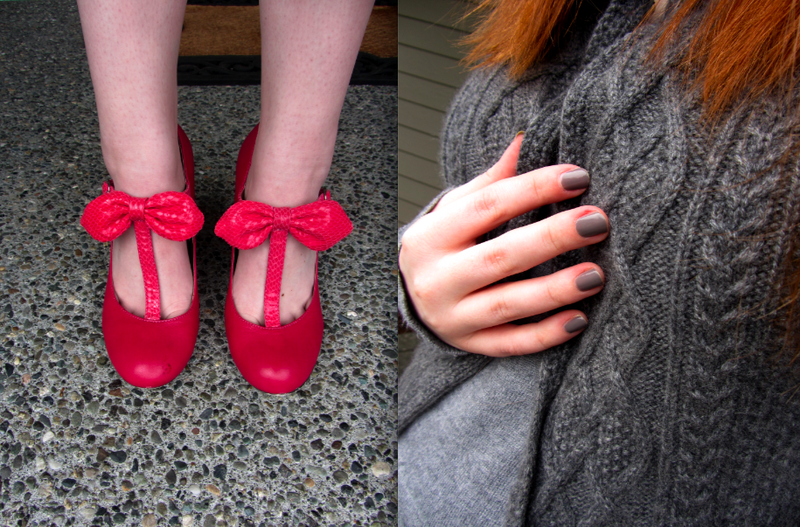 I also added some more red accessories (besides my manicure). Just the sort of cute everyday look I’d be likely to wear. In other news, the Game On! Diet is going really well! 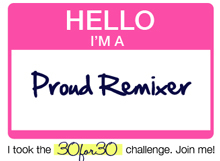 I’m still pretty pumped and I’ve had a perfect score so far! 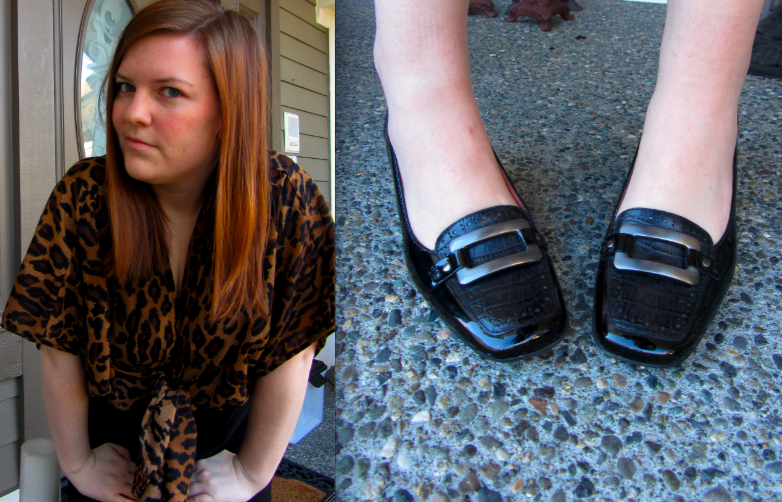 Posted on February 3, 2012 by Cortney A.
Outfit Details: Animal Print Thing: Goodwill; Dress (old): JCPenny’s; Shoes: Rockport. 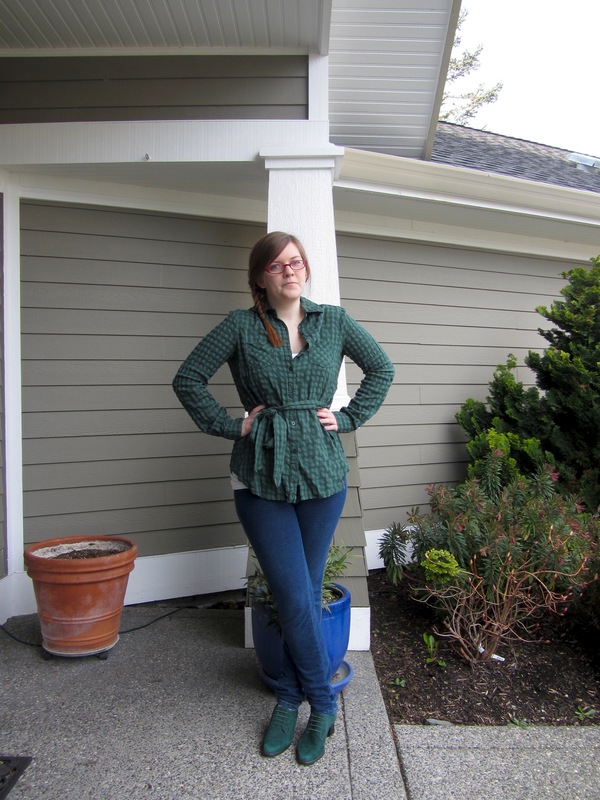 Since O is for Closet Orphan, I chose to make an entire outfit of closet orphans. I almost always pass over these items to wear other ones. 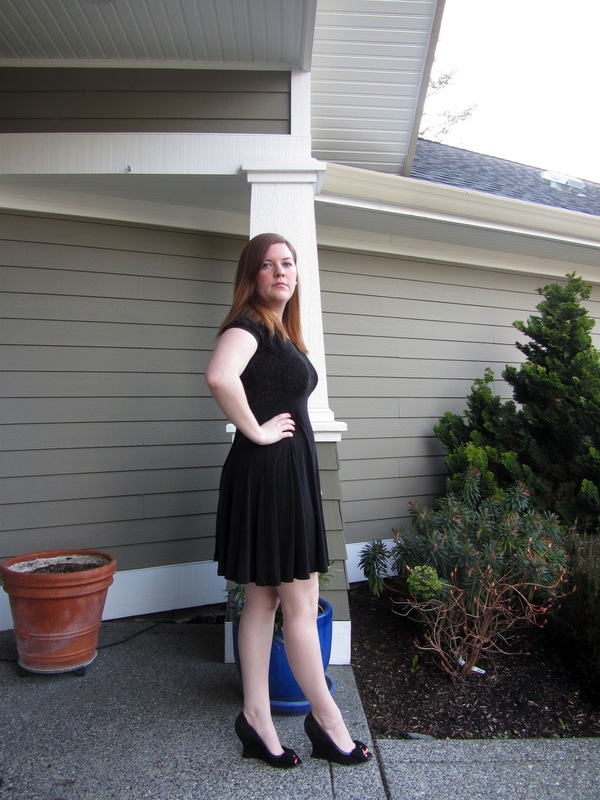 I used to wear this dress a lot, but I haven’t worn it once in about a year. The shoes I always pass over for something a little younger (they just feel more “professional working woman” to me). And the weird animal print thing? I’ve never worn it. I’ll be honest. Animal print frightens me. I avoid it quite often. However, my mom bought this animal print thing for a costume party and I snagged it from her afterwards. I figured I could find some way to use it. But animal print is so loud and out there I almost always pass it over. Does anyone ever have those days that should be good photography days but just aren’t? The outfit is fine, it’s flattering, you know you look good. However, for some reason, even though you’ve been posing in front of your camera for almost a year it’s like you’ve suddenly forgotten how and you just look incredibly awkward in every picture? That was me, today. Posted on February 2, 2012 by Cortney A. Today was N is for Neutrals and Neons, and The Winter Edition is have a Group Open to Interpretation. To fit into both of the challenges, I chose to interpret the shape of the outfit we were coping–keeping all the basic parts but not the colors. 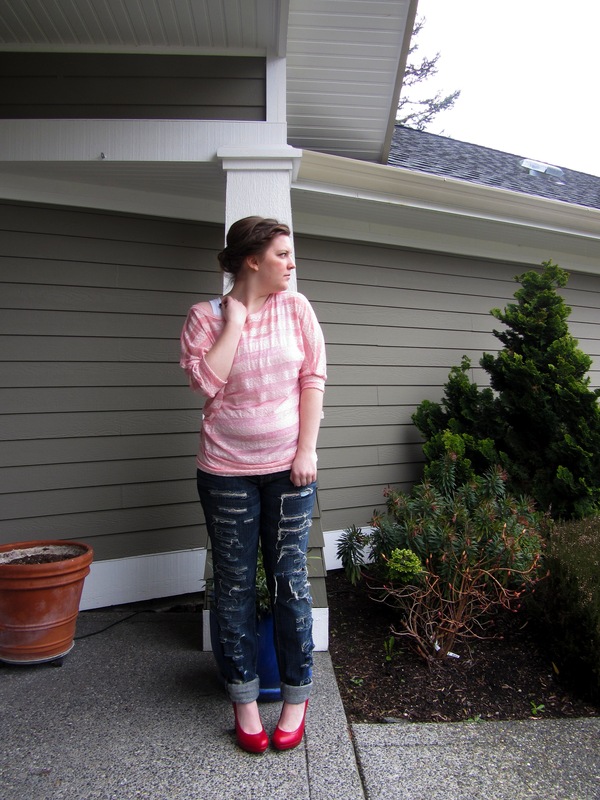 I made my outfit mostly neutral, with pops of pink. 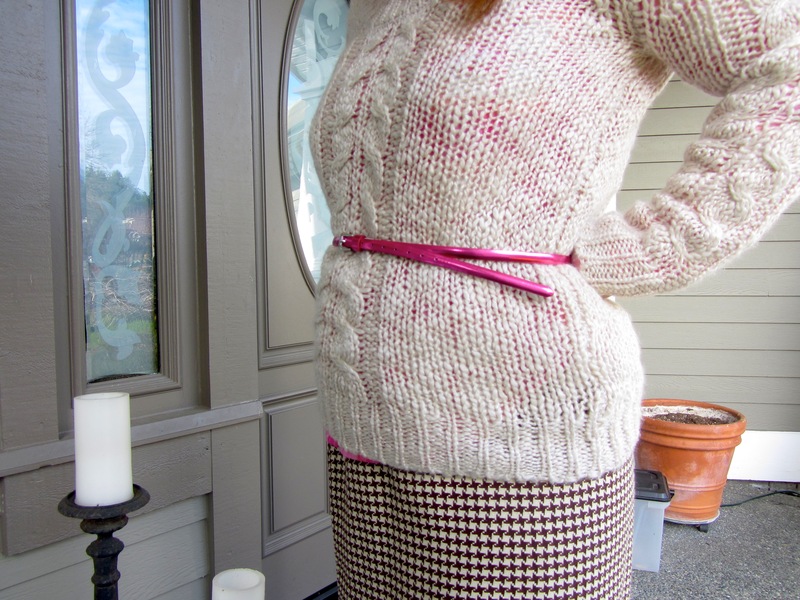 Then I added the neon pink belt because I need to define my waist most of the time or I look like I gigantic block. 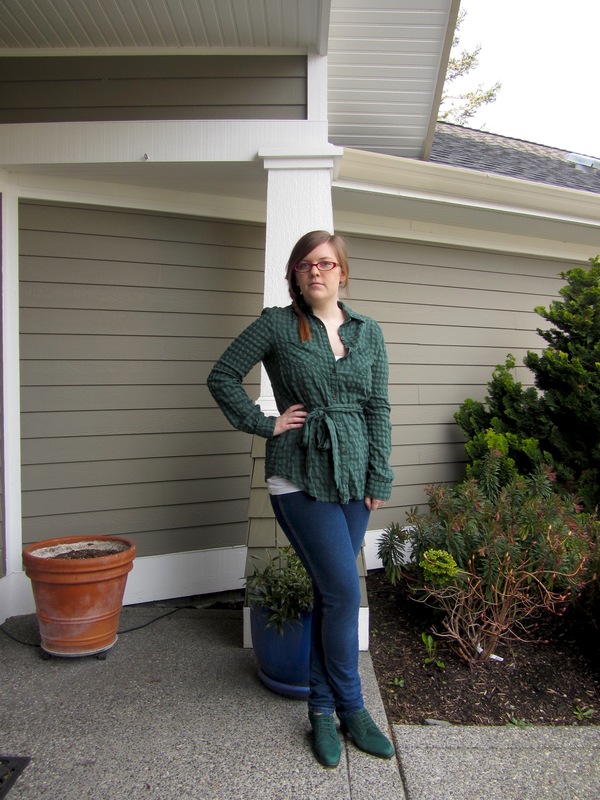 Also, it is incredibly difficult to get a sweater over a button-up. Seriously. How do people manage it? Sadly my normal picture taking spot was half in sunlight and half out, so I moved my photo taking place a couple feet to the left. The background isn’t nearly as pretty today. 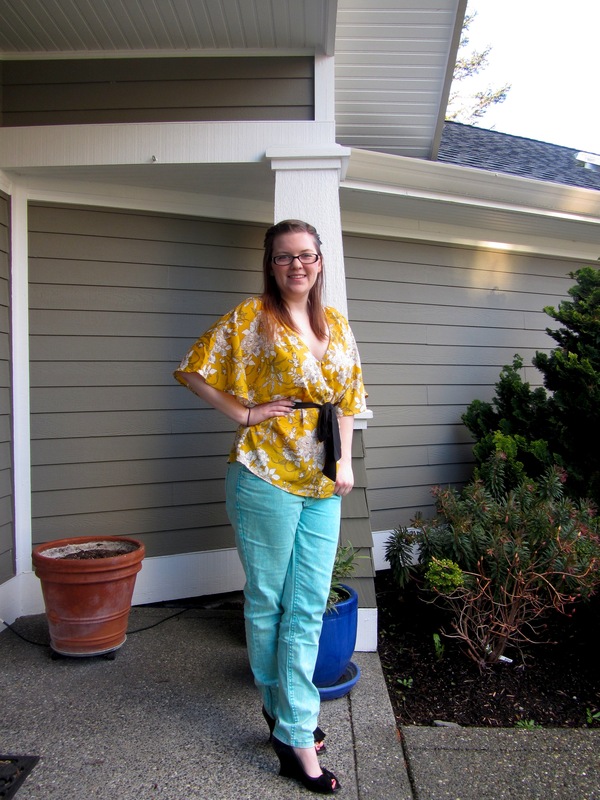 23 year old, personal style blogger attending college (for the second time).